How much fat is allowed? To begin with, the main difference between fat spread and butter is that the latter is a fatty product derived exclusively from the milk of cow and/or buffalo in the form of an emulsion (an emulsion is a mixture of two liquids that would not normally mix) of the type ‘water in oil’. Further, milk fat in butter shall not be less than 80 per cent by weight. Fat spread means a product in the form of water in oil/fat emulsion. It may or may not contain milk fat; fat shall not be more than 80 per cent and not less than 40 per cent by weight. As per Food Safety and Standards (FSS) Regulations, both butter and fat spread should not contain animal body fats. Be that as it may, what is common to butter and fat spread is that they are concentrated sources of fat and calories. While one does not have to eliminate either from their diet, moderation in consumption is advisable. The following report covers four popular brands of fat spread and assesses these on parameters that are expected to help consumers make an informed choice. The tests were carried out in anNABL-accredited laboratory. 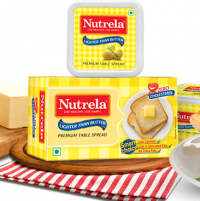 It may be noted that of the four brands, one, Amul Lite, was mixed fat spread; the others – Delicious, Nutralite and Nutrela – were vegetable fat spread. All brands carried the AGMARK logo. Milk fat spread: Fat content will be exclusively milk fat. Mixed fat spread: Fat content will be a mixture of milk fat with any one or more of hydrogenatedrefined edible vegetable oils (vanaspati), unhydrogenated or interesterified fat. Interesterified fat is a type of oil where the fatty acids have been moved from one triglyceride molecule to another. This is generally done to modify the melting point, slow rancidification and create oil more suitable for deep frying or making margarine/fat spread with good taste and low saturated fat content. Manufacturers are increasingly using interesterification in place of partial hydrogenation in an attempt to make more healthful spreads, but there is no science to know for sure whether, or to what degree, the fats created in this way are better than trans fats. Vegetable fat spread: Fat content will be a mixture of any two or more of hydrogenated, refined vegetable oils or interesterified fat. To avoid trans fat, make sure no ‘partially hydrogenated oil’ is listed in the ingredients. You can see list of our CV Surveillance Series- Fat Spread below, perform Side-by-Side comparison. If you need further help, do have a look at Conzumr Guides and Tips. Alternatively you can view all Fat Spread to choose your own favourites. Fat and oils are a major ingredient of fat spread. As per Food Safety and Standards Regulations, fat in fat spread should not be less than 40 per cent by weight and also be not more than 80 per cent. Fat in all brands was found to be within the prescribed legal limit. Highest fat percentage was found in Delicious (74.67per cent), and the lowest in Amul Lite (69.78 percent). Melting point of fat is the upper limit of the temperature at which the melting of fat takes place. As per FSS Regulations, in fat spread the melting point of extracted fat should not be more than 37 degrees centigrade. Normal human body temperature is 37 degrees centigrade. Hence, a lower melting point is better for consumers. The melting point of extracted fat was within the prescribed limit in all brands. Melting point of extracted fat was lowest in Nutrela (28.2 degrees centigrade) and highest in Amul Lite (34.2 degrees centigrade). The acid value is a common parameter in the specification of fats and oils and it is a measure of the free fatty acids (FFA) present in the fat or oil. FFAs are a source of flavours and aromas. These flavors and aromas are considered to be a defect in oils and fats. As per FSS Regulations, in fat spread the acid value of extracted fat should not be more than 0.5. So, lower is better for consumers. 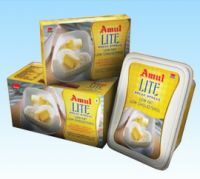 Acid value of extracted fat was lowest in Amul Lite (0.21) and highest in Nutralite and Delicious (0.49). As per FSS Regulations, moisture in fat spread should not be more than 56 per cent and not less than 16 per cent by weight. Moisture percentage in all brands was found within the prescribed legal limits. Vitamin A plays an important role in healthy bone growth, supports the immune system, and is essential for reproduction. It also supports skin health and is critical for good vision. As per FSS Regulations, fortification of fat spread with Vitamin A is mandatory. All the four brands have claimed on the label that they added 900 micro grams of Vitamin A in 100 grams of fat spread. Vitamin A was found highest in Nutralite (1,110.29 micro grams/100 grams) and lowest in Nutrela (353.4 micro grams/100 grams). All brands provided the required information on their labels. To Recieve updates and possible rewards for Fat Spread please sign in.